I love this story and you're right, it is full of symbolism which makes it all the more beautiful. I too really love this story. I haven't read it in a few years -- I'll try to remember to pull it out next year. I've never read this story, i'll have to do it next year. 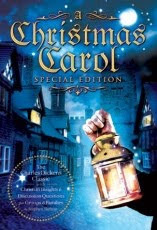 A Christmas Carol has always been one of my favorite stories. I've always wondered about the thoughts Dickens had as he wrote it. Thanks for posting this. You know, I don't think I've read the book either. It is one of those that you think you know the story but when you read it, you'll find that it isn't quite what the source material was. I'm glad you had a chance to read this before Christmas - this version is definitely a keeper!